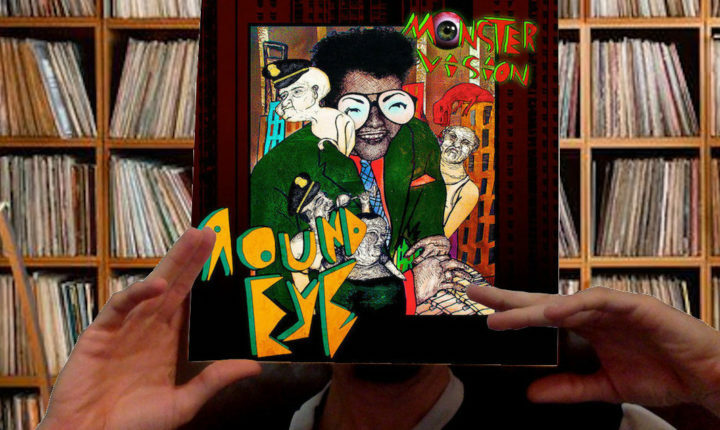 A deeper look at the grooves pressed into the Monstervision LP by Round Eye. Since first appearing as the “band on the other side of a split album with Libyan Hit Squad” a couple of years ago [the idea was for Full Circle to be a sort of bridge between projects for LHS/Round Eye singer Chachy Englund – one band was ending, the other one starting –ed], Round Eye has always been upfront regarding its’ affinity for vinyl releases, but the band’s sophomore album proves that this group of maniacs isn’t just dabbling in wax; they know how to build an album so that it is perfectly measured and balanced to sit evenly on a 12” long-playing record. Here – more than on the CD release of of the same album (which was released earlier this year), every song and vignette comes off as having been carefully tailored to fit into this run-time and make a tight and focussed presentation. For a wild-eyed and notoriously manic freak-punk band, that kind of care for presentation is unheard of, but it is impossible to deny on Monstervision. The album opens with an introduction from comedian and film critic Joe Bob Briggs, who basically outlines the entire focus of this concept album; here (over a very NOFX-ish bed track featuring gaudy C&W musicianship and wah-wah-wah vocal backing) listeners are told they’re going to get: an order of “Sweet and Sour Trump, General Tso’s Clinton, a cup of steaming hot Red, White and Blue tea and an inevitable and ever-ominous fortune of doom….” It sounds like a pretty ambitious order and, for a band who has historically been at its best while pointing in the general direction of an idea rather than right at it (historically, it has always been the energy of Round Eye’s music which has captured listeners’ collective imaginations – not their wordplay), the chance that Monstervision is actually going to deliver a multi-course political dissertation seems unlikely – but the chance is an attractive one nonetheless and when “Commie Blues” kicks over after Briggs’ intro with a very short lyric sheet (the title lyric is all there is) but a great, mad and manic freak-punk performance, listeners will buckle themselves in for the ride, excitedly. The energy just keeps flying frenetically and in every direction from Monstervision so its A-side progresses. After “Commie Blues,” Round Eye focuses a little more tightly and shifts from “public” to “personal” with “Billy.” Featuring the final recorded performance by Iggy and The Stooges saxophonist Steve Mackay, “Billy” sears senses with saxophone, wild and woolly guitar parts, multi-tracked vocal harmonies (the lyrics of which are, as stated, basically unintelligable) and throws listeners into complete sensory overload because it never slows down and then boils over into “Sifter,” which keeps the same sensation rolling with only a slightly diminished tempo. While the B-side of the album doesn’t exactly lean stylistically toward material like “Pink House,” there’s no question that the B-side does feature some more musically varied material and some impressive changes in the band’s established forms. First, “The Cat, The Mouse and The Dog In Between” opens the side with a truly sleepy and relaxed rock run-through which seeks to soothe listeners with some dense and smooth horns before “Ritchie” angles toward a more roiling permutation of punk that features a perfectly clear and intelligible vocal which completely dismisses the world at large (the words “Reality TV never looked so good” have never before felt so poignant). After that, “Nest” actually works in some shockingly lush vocal performances before “Crinkle” boldly conforms to a three-minute song length and the side just winds both down and to a close with strings, singalong vocals and a gradual cessation of power and volume rather than just slamming the record closed. In print, that might sound like a bit of a letdown – again, this band is regarded to be at its best when they’re flying apart at the seams – but that Round Eye is evolving as this album plays is perfectly obvious and leaves listeners excited to find out what might be coming next from the band at B-side’s close. In From Out Of Nowhere – Round Eye Emerges – [Feature Article]? Monstervision is out now. Buy it here on Amazon.